Although zebrafish are not deadlifting weights in orbit, they are helping researchers learn about muscle changes during their stay aboard the International Space Station. This impacts not only the fish, but also the crew and can have implications for Earth-related muscle challenges too. The Japan Aerospace Exploration Agency's (JAXA) Zebrafish Muscle investigation observes the effects of microgravity on the zebrafish, Danio rerio, a tropical freshwater fish belonging to the minnow family. This research has the potential to lead to new drugs or treatments for patients on extended bed rest or with limited mobility. In addition to the potential human benefits, results from this study could aid researchers in developing countermeasures for muscle weakness in astronauts living in microgravity during extended missions. "The main question of the Zebrafish Muscle experiment is whether atrophy of muscles under microgravity also occurs in fish, and why that muscle atrophy occurs in microgravity," explains Atsuko Sehara-Fujisawa, principal investigator and professor at Kyoto University in Kyoto, Japan. Muscle atrophy is the wasting of muscle tissue. This occurs in microgravity since the muscles are not used to resist the force of gravity, as they would be on the ground. Astronauts mitigate this atrophy through prescribed daily exercise, yet some still lose bone and muscle mass during extended spaceflight. In this investigation, the zebrafish is used as a model for comparison to larger organisms. Researchers use model organisms such as plants, animals or microbes like yeast to study the influence of microgravity on cells. Taking these organisms to space allows for examination of growth and development and physiological, psychological and aging processes without the impact of gravity. 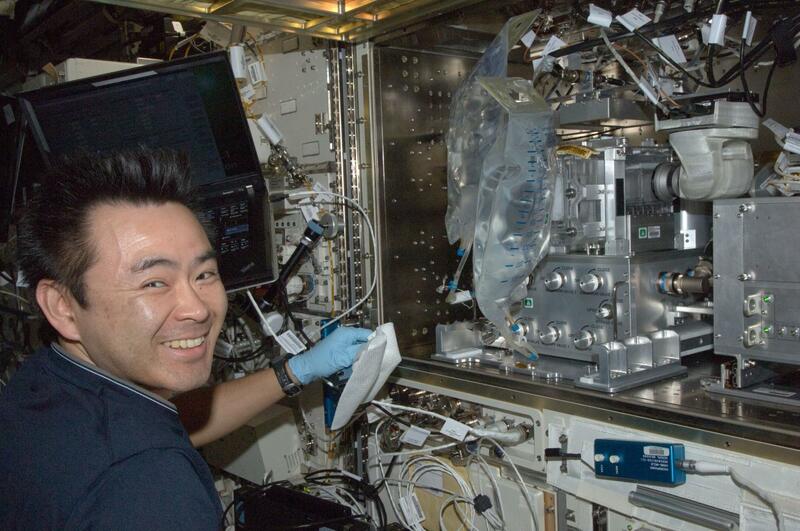 Previous observation of Medaka fish aboard the station monitored changes in bone impacted due to the microgravity environment. Researchers study zebrafish because of their transparency compared to other fish. Scientists use transgenic zebrafish, which express fluorescence proteins inside the body to obtain three dimensional imaging of skeletal muscle and tendon tissues within the zebrafish. This means that the zebrafish contain DNA that is inserted experimentally. Furthermore, the availability of whole genome sequencing in zebrafish makes it an essential organism to study. This reveals the genetic characteristics of an organism with a precision that other technologies cannot match. This investigation employs the station's Aquatic Habitat, an aquarium in microgravity. An LED light fixed to the top of the habitat illuminates the study for recording and simulates the sun's light on the surface of the water. The fish use their instinctual response to this light and swim in a position similar to upright on Earth. View the zebrafish swimming and eating during their spaceflight of more than 21 days on the space station in these JAXA videos. A total of 18 zebrafish were launched to the space station. Five fish returned alive on a previous Soyuz spacecraft and some chemically preserved fish will be returned with the completion of the fifth SpaceX commercial resupply mission. The Zebrafish Muscle research team will compare gene expression - the process of determining a cell's function - profiles between fish flown in space and control fish on Earth. Specifically, they will look to see if fish muscle deteriorates in space and recovers upon return to the ground. The team also will examine if fish tendon is sensitive to microgravity. "We hope that this research enables us to understand how microgravity affects muscle mass and strength in terms of genes and molecules and what kinds of molecular mechanisms contribute to the recovery of muscle after the exposure in microgravity," said Sehara-Fujisawa. "This research should clarify whether physical exercise and anti-gravity reactions share common gene regulation. It would be wonderful if this research gave us hints to ameliorate muscle atrophy due to aging or diseases." JAXA and its collaborating partners are proving that studying striped fish in space may help researchers see spots for improvement to weakened muscles on Earth.